Please note this item is currently out of stock, new stock is due April 2019. We will continue taking orders and will not process your payment until your order is ready for shipping. 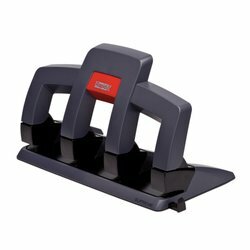 4-hole punch equipped with Rapid's innovative Press Less Technology which reduces the power needed with more than 50% compared to traditional hole punches.